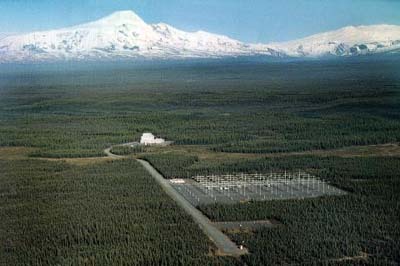 I've always thought it was hilarious that HAARP, the high-frequency active auroral research program, is a favorite fixation of tinfoil hat-types, many of whom are convinced that it's part of some secret government plot to control the weather. I actually had a chance to eat dinner with one of the founders of HAARP last month, and jokingly asked him how the weather-control thing works. "No, no, you've got it wrong—" he wagged his finger with a conspiratorial smile. "it's mind control!" Pictured: HAARP, probably not melting your snowman. Even putting aside some of the more obvious problems with the idea that HAARP is a weather-control station (like the gibbering paranoia and the fact that it's often invoked to assert that global warming is an illusion created by the Obama administration), it's still patently ludicrous from a purely physical perspective. With the incredible amounts of data available to us from satellites and monitoring stations around the world coupled to some of the best computers running the latest models, we can barely predict the weather more than a week in advance, yet there are people convinced that you can produce a hurricane on demand with a comparatively dinky 30-acre antenna array in a remote corner of Alaska. The boring truth is that it's basically an atmospheric imaging tool, using electromagnetic pulses to study the ionosphere. The reason this all strikes me as so funny is because—again, ignoring the obvious problems with the idea—if you WERE looking for an enormous, programmable, government-sponsored weather control apparatus, it would look a lot more like the seemingly interminable fields of massive turbines that have cropped up around the country in the past decade or two. In terms of the sheer quantity of energy manipulated, as well, wind farms are much more likely to have an effect on weather—Alta, the largest wind farm in the US, has a 1320 MW capacity—more than 360 times the power output at HAARP. So how likely is it that we're affecting the weather, causing droughts or warm winters in an ironically quixotic effort to combat the climate-changing effects of fossil fuels? Surprisingly, it looks like a genuine possibility. Weather systems are so chaotic as to be almost entirely unpredictable—you've undoubtedly heard the bit about butterflies and hurricanes—but installing an enormous air-deceleration array must have some effect on weather, as does everything down to a baby's breath. Of course, we'd have a hard time knowing exactly what that effect is, or how significant, without shutting down all the turbines for a few years to see how it changes things (a prospect that a lot of people would be rather upset about). In one of the few authoritative papers on the matter, renowned geophysicist David Keith and colleagues performed extensive simulations using European weather data and a model where wind power generates twice its current capacity, to account for future growth of the industry. What they discovered was that the wind farms did indeed produce temperature changes of as much as half a degree centigrade (up in some regions, down in others), and changes in precipitation on the order of several percent! To understand how, we can use the principle of conservation of energy, along with the power output and efficiency ratings of the turbines to understand just how much kinetic energy we're sapping from the air overall. Based simply on conservation of mass, the absolute upper limit of kinetic energy that a turbine can pull out of a moving air-mass is 59%. Of that 59%, about one fourth is lost as heat, sound, and turbulence, meaning that a turbine creates ~.75 watts of electricity for every 1 watt that it pulls out of the air. Conveniently, the ten largest wind farms in the US combined have a collective power-generation potential of close to 7.5 gigawatts, which means at most we're pulling 10 gigajoules of energy out of the air every second. "Although the generation and dissipation of kinetic energy is a minor (≈0.3%) component of global energy fluxes, the winds mediate much larger energy fluxes by transporting heat and moisture. Therefore, alteration of kinetic energy fluxes can have much greater climatic effects than alteration of radiative fluxes by an equal magnitude." By stalling air currents and creating lower-pressure zones downwind of the farms, we may in fact be altering large-scale weather patterns in unforeseen ways. Given this somewhat alarming potential to muck things up, it's important to keep in mind that pollution from fossil fuels is statistically guaranteed to be responsible for several hundred thousand deaths each year, and that just about any step away from that figure is a good one, even if it has some unpredictable consequences. However, the results of Dr. Keith's study make it clear that the possibility warrants further investigation, hinting at a future where, if we got our best scientists on the matter and made a concerted effort, perhaps humans could someday control the weather, selectively slowing air currents to end droughts or prevent hurricanes from forming. And if it DOES turn out that the wind-energy boom is all part of some villainous plot to control the weather, there's only one person who can save us.